Sunday May 28th 1899 I was busy most of the forenoon. I read some and read and rested all afternoon. There was a severe storm went north of us about supper time. Monday May 29th 1899 I had Luther to help me nearly all the forenoon. We worked and he cleaned the cellar. Elmer Anderson was here a little while. Will and I went to town in the afternoon was over to Woolfs and stopped at home a little while. I saw the girls in town. Was busy till bed time after coming home. The river is very high. Rob Whetstone is 16 years old today Tuesday May 30th 1899 I was very busy all forenoon. Will lost one of last years calves and had to take the hide to town in the afternoon I went up to Nelsons and spent the afternoon. The wind blew the sand awfully this afternoon. 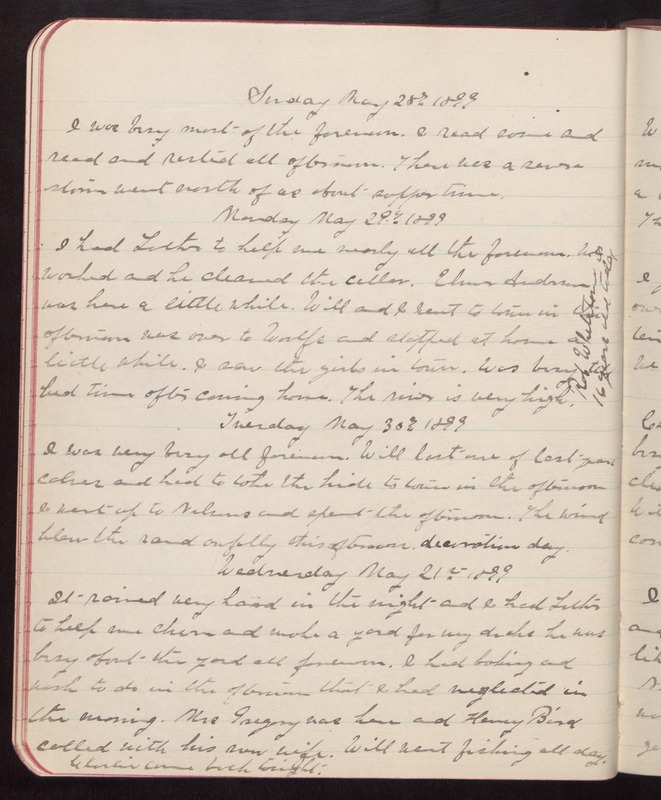 decoration day Wednesday May 21st 1899 It rained very hard in the night and I had Luther to help me churn and make a yard for my ducks he was busy about the yard all forenoon. I had baking and work to do in the afternoon that I had neglected in the morning. Mrs Gregory was here and Henry Bird called with his new wife. Will went fishing all day. Charlie came back tonight.